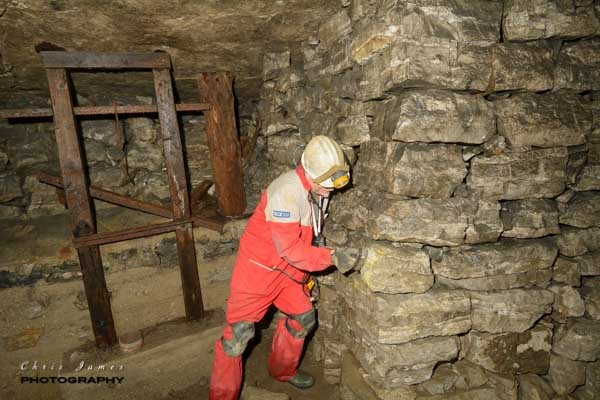 In June, It was reported that vandals had gone into Holme Bank chert mine at Bakewell, and sprayed graffiti right through the workings. 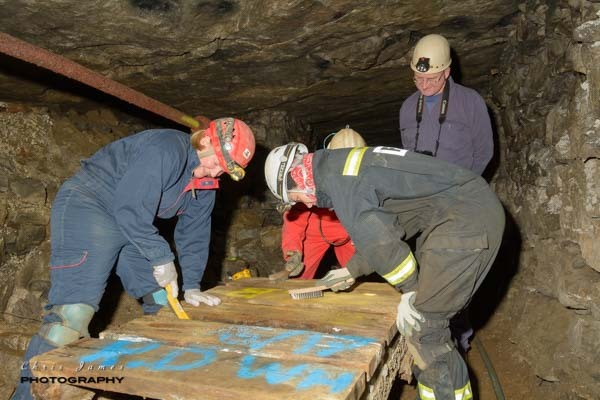 This mine has a particular place in the hearts of many PDMHS members, as it has been the subject of numerous underground trips over the years. So at the end of August, Paul Chandler arranged a cleanup session, and a joint working party of PDMHS and Masson Caving Group members spent an evening in there getting rid of as much of the graffiti as we could. 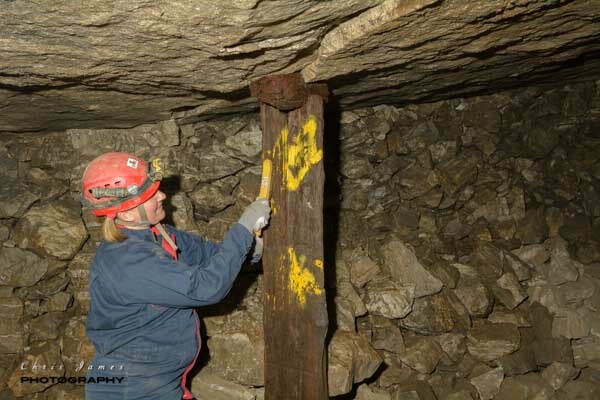 The mine has suffered from graffiti for quite a few years, and different types of paint has been used. Some of it came off quite easily, and some of it required a lot more hard work. Our first task was to clean the flat-bed waggon near the bottom entrance, which had been badly covered in bright yellow and blue graffiti in June. Fortunately, this was easier than expected, and after some hard scrubbing by the workers (with Paul enjoying his role as gaffer! ), we had removed the paint completely. There was quite a lot more paint in the same area, so we all got stuck in to that next, before moving down to the flooded area of Holme Hall Mine, where the pipes of the pumping engine are. There was bright yellow paint daubed on the walls and some of the timber roof supports in this section, but we managed to get most of it off. We then followed a trail of graffiti through the workings up to the M1 area. Here the paint was mainly on the hard limestone pack walls, and Vicky ended up with her brand new wire brush almost worn out! With all six of us working hard, we managed to remove a good deal of the paint, and achieved a satisfying result. 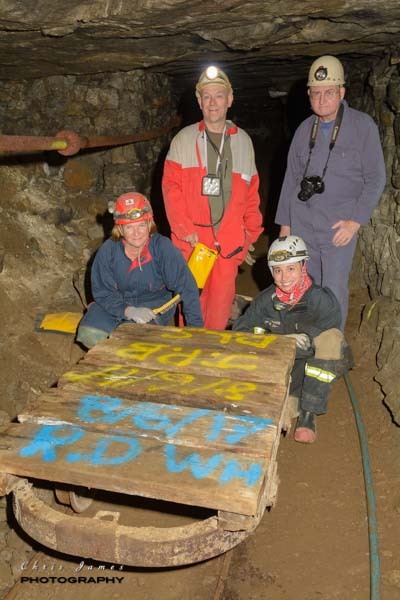 It had been a good evening’s work, and it was nearly 10pm by the time we emerged from the mine, to a lovely starry sky. Thanks are due to Paul for organising it, and everyone else who took part. Below are a few photos of the evening’s work. 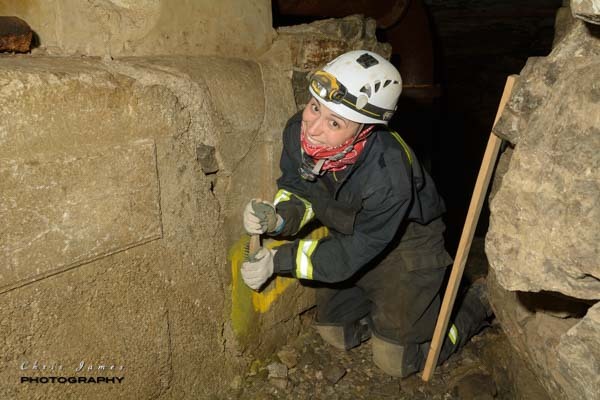 This entry was posted in News, Underground mine trips by chris. Bookmark the permalink.